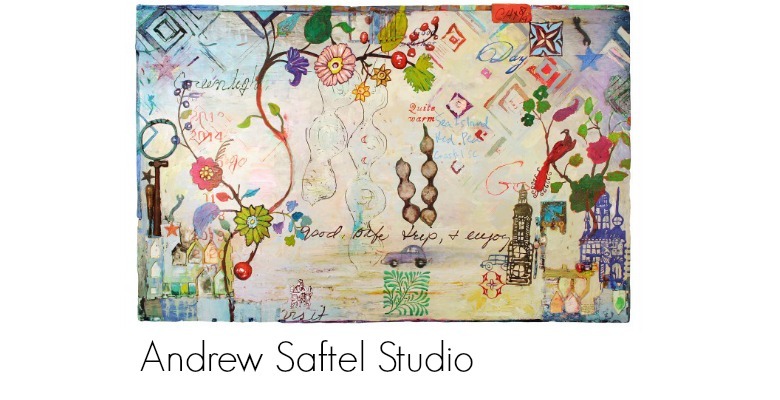 I've been connected with the folks at the St. Andrew's Sewannee School for some time. This is where I'll be teaching my upcoming summer collograph workshop, at the annual Shakerag Workshop. As an artist living and working in rural Tennessee, thinking about how I connect with nature is a big part of what I do. I've written about my experiences gardening, spending time with the earth and just taking it all in. This is why I wanted to share a wonderful book with you, written by a Botany professor at Sewannee by the name of David Haskell. Over the course of one year, Haskell observed the activity of 1 square meter of land on a wooded slope in Shakerag Hollow, Sewannee, Tennessee. His book, The Forest Unseen, chronicles just what he observed and witnessed during the 12-month period. By taking time to stop and really observe the land, Haskell saw many things that others most definitely would miss. As an artist, I rely very heavily on the powers of observation. All artists are individuals looking at the world, trying to glean something from what we see. That's what I experience when creating a new piece of work. I often feel that as a society, we need more hope. And nature is a great place to look and find that such a hope does exist...if we simply stop and look for it. Here's a short video about the book and Haskell's experience. I think you'll enjoy it. 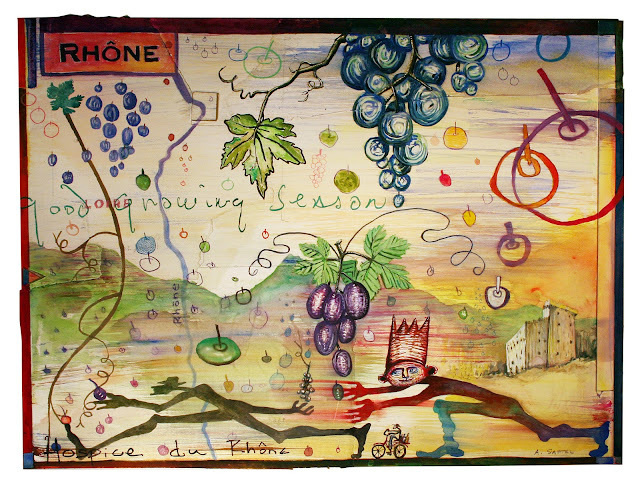 When asked to create a piece of art to be used for the Hospice du Rhone event at Blackberry Farm, I immediately knew that some of the imagery I have been recently developing would be perfect. 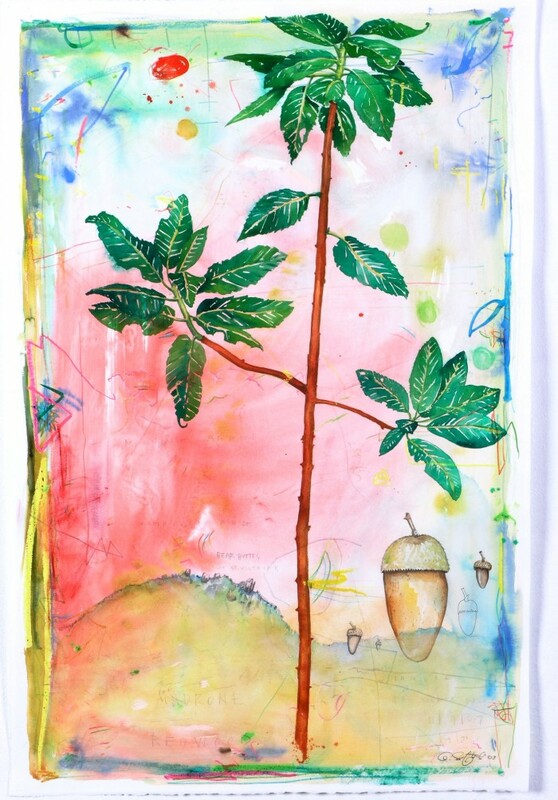 Growing Season, 2013 watercolor, pencil, colored pencil & collage on watercolor board 25x36"
﻿﻿Located at the bottom right of Growing Season is a character I call The King of Falling Fruit and on the left Reaching Man. They both represent an attitude towards life, which is that one needs to constantly reach and stretch in order to find things in life. As artists we need to constantly reach and search for ideas and images for our work; to experience as much as possible in order to speak about what we find. To me, fruit is a metaphor for good things in life. There is fruit everywhere in this piece, like rain from the sky. In this case the fruit is grapes and the King has his hands out to get him some. The title of this work, Growing Season, is derived from handwriting by John Coykendal, the master gardener at Blackberry Farm. This could be a straightforward reference to a growing season in a garden or vineyard but also serves as a reference to the growing season of our lives from birth to death.